BBC. 7 episodes: 21 December 1963-1 February 1964. Starring William Hartnell as ‘Dr Who’, William Russell as Ian Chesterton, Jacqueline Hill as Barbara Wright and Carole Ann Ford as Susan. So far in my top ten classic Doctor Who stories I’ve selected one personal favourite (‘The Robots of Death’) and one that’s widely regarded as an excellent example of a particular type of story (‘The Tomb of the Cybermen’). This week I’ve settled on a story that might not quite be among the best dramatically but which I’ve chosen for its overall significance for both the internal and the external history of Doctor Who. According to some accounts, ‘The Daleks’ was the first Doctor Who story. It wasn’t of course: that was ‘An Unearthly Child’. (Or, strictly, ‘An Unearthly Child’ was the first episode followed by an Earth-based Stone Age adventure that has retrospectively come to be known as either ‘100,000 BC’ or ‘The Tribe of Gum’. For the first three years of Doctor Who each episode had its own title but there were no overarching serial titles. ‘The Daleks’ is now the generally accepted retrospective title for a serial originally known as ‘The Mutants’ and sometimes – after the title of its first episode – as ‘The Dead Planet’.) But when Doctor Who script editor David Whittaker came to write the first novelisation – which itself changed title from its first edition, Doctor Who in an Exciting Adventure with the Daleks to become simply Doctor Who and the Daleks when it came under the Target Books imprint in the 1970s – he wrote the Stone Age adventure out of Doctor Who continuity. Hence the novelisation proceeds straight from schoolteacher Ian Chesterton’s first meeting with the mysterious ‘Doctor’ and his and Barbara Wright’s entry into the TARDIS to the adventure with the Daleks on the planet Skaro. Moreover the novel’s account of how Ian meets the Doctor is different again from the television episode. And in 1965 cinema-goers would see yet another origin story in the feature film Dr Who and the Daleks in which the Doctor is an eccentric but very human inventor rather than an alien ‘wanderer in the fourth dimension’. I mention all this in passing just to make the point that the messing about with timelines and accepted continuity that has been a feature of Steven Moffat’s Doctor Who is not a new phenomenon but something that has been going on pretty much from the start. And so to ‘The Daleks’. This might well be the most important story in the external history of Doctor Who in so far as it saved the series from cancellation. The BBC Written Archives reveal that the BBC’s Controller of Television, Donald Baverstock, had been less than wholly enthusiastic about the early episodes of Doctor Who. There was even a suggestion that the series, originally intended to run all-year round, might have been cancelled after 13 episodes. However, there was a significant increase in viewing figures during ‘The Daleks’, rising from 6.9 million for the first episode (‘The Dead Planet’) to 10.4 million for the last (‘The Rescue’). And the Audience Research Department recorded an increase in the ‘appreciation index’ – the mechanism by which the BBC measured what viewers actually thought of its programmes. 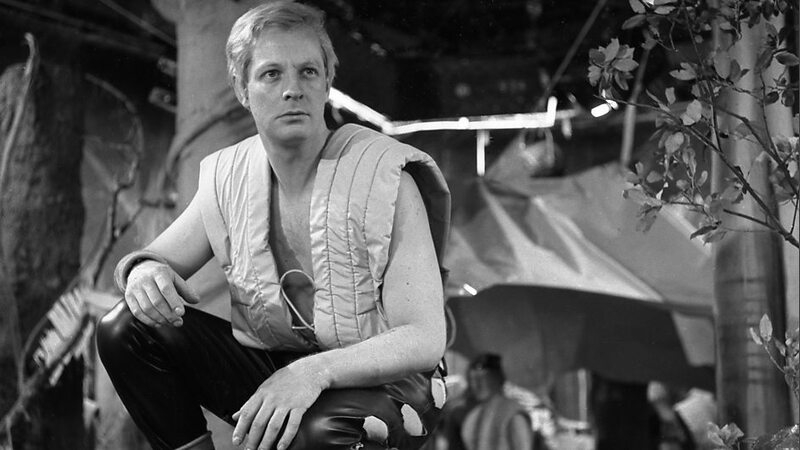 It was evident that the BBC now had a popular success on its hands: Baverstock gave the green light for the series to continue. 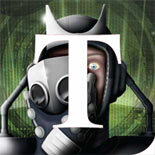 The Travellers … find themselves in a world ruined by a ‘Neutron’ bomb, a destroyer of human tissue. Two races inhabit this world, the first living in an underground city, protected by anti-radiation suits and the second living miserably in the petrified forests among lifeless plants and crystallised flowers, protected by an anti-radiation drug and existing on rapidly diminishing stores of food. The race living in the underground city are preparing to emerge to rebuild the world, since radiation is diminishing and the Travellers find that they are forced to involve themselves in the struggle between the two opposing sides, the beauty and grace of one unevenly matched against the brilliant intelligence but malignant evil of the other. Hence ‘The Daleks’ can be placed within a tradition of apocalyptic science fiction in which civilisation has been destroyed and the survivors must contend with radiation pollution. This was a very real anxiety at the time. The Campaign for Nuclear Disarmament had been founded in 1957 and was at its peak in the early 1960s: its annual Easter marches to protest at the nuclear weapons development centre at Aldermaston drew tens of thousands. The effects of radioactive fall-out informed the work of science fiction novelists including John Wyndham (The Chrysalids), Poul Anderson (Twilight World) and Nevil Shute (On the Beach). ‘The Daleks’ came only two years before the controversy surrounding Peter Watkins’s documentary-drama The War Game (1965) which depicted a nuclear attack on the south east of England and documented the consequent social disintegration as the emergency services are unable to cope and the police carry out mercy killings of those too sick to survive. It was a harrowing television film that the BBC deemed ‘too horrifying’ to show. I’ve suggested already in this blog that Doctor Who was often at its best when the cultural influences on the series are apparent: ‘The Daleks’ demonstrates this point yet again. The two races of the planet Skaro – the mechanical, city-dwelling Daleks, so mutated by radiation that they have retreated underground and are forced to live in armoured shells, and the handsome forest people the Thals, a race of hunter-gatherers who wish to live in peace – might be seen as equivalents of the Morlocks and Eloi in H.G. Wells’s foundational science fiction novel The Time Machine (1895), the former a hideous subterranean race, the latter beautiful, child-like and gentle. There are also parallels with the Treens and Therons in the popular comic strip Dan Dare – Pilot of the Future, which ran in the boys’ adventure paper Eagle between 1950 and 1969. (Peter Cushing’s ‘Dr Who’ is seen reading Dan Dare in the film Dr Who and the Daleks.) The Treens, who inhabit the northern hemisphere of Venus, are a race of dehumanised, totalitarian technocrats who obey without question their chief scientist the Mekon, while the Therons of the southern hemisphere are, like the Thals, tall, blonde, handsome and pacifist. In both Dan Dare and ‘The Daleks’ there is an ideologically charged scene where Dan/the Doctor has to persuade the Therons/Thals to shake off their pacifist instincts and take up arms against the enemy that seeks to destroy them. 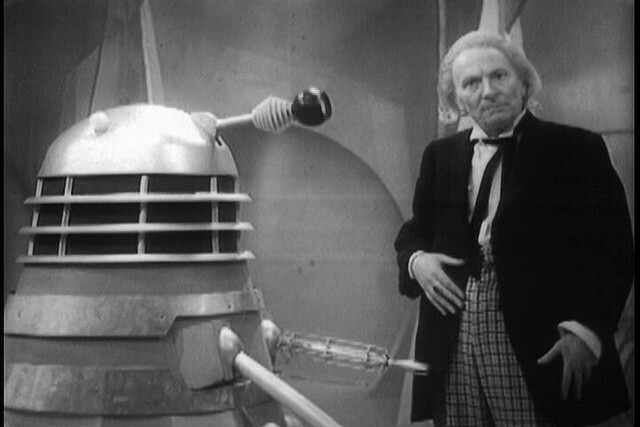 Terry Nation’s synopsis had described the Daleks simply as ‘hideous, machine-like creatures [with] no human features. A lens of a flexible shaft that acts as an eye. Arms with mechanical grips for hands.’ It was designer Raymond Cusick who came up with the actual ‘look’ of the Daleks – which according to his own account was inspired by seeing a troupe of Russian dancers whose long skirts gave the impression of rolling across the floor. Hence the inverted ‘pepper pot’ design of the Daleks with their metallic ‘skirts’ and rotating eye-stalks. Whatever else they were, the Daleks were a brilliant piece of design. Their success was due in large measure to the fact that unlike many later Doctor Who monsters they did not look like extras wearing baggy rubber monster costumes. Their appearance and silent movement are both menacing and plausible. They also look superb in metallic black and white: the colour serials never really got the colour of the Daleks right with their gold and even white variants. It soon became a standard joke that the Daleks’ plans to conquer the universe would come to a crashing halt the first time they encountered a flight of stairs, but in fact this is not an issue here. For one thing the Daleks are not presented here as being bent on a programme of galactic conquest – that would come later – but rather with the simple matter of survival. And for another they live in a metallic city with smooth, polished surfaces where they are powered by static electricity and are able to ascend to different levels via lifts. Cusick based the design of the Dalek city on the film Things to Come (1936), albeit conceived on a smaller scale. The point is that the Daleks have built the city for themselves as a functional habitat – emphasised by the low ceilings which are cramped for the human actors but the perfect size for the Daleks themselves. It was only in later stories when the Daleks left their original habitat that the problem of their motion became an issue. It’s become accepted in academic criticism of Doctor Who to see the Daleks as standing in for the Nazis and their desire to ‘exterminate’ all other races as an allegory for the Holocaust. In fact it’s not entirely clear whether this was the intention: Nation would later make the allegory explicit in ‘Genesis of the Daleks’ but it may well have been a process of retrospective association rather than original intent. Rather, ‘The Daleks’ seems a parable of race hatred in general. The Daleks have a pathological ‘dislike for the unlike’, as Ian explains to the Thals: “They’re afraid of you because you’re different from them.” This idea has been carried forward into the new series: in the 2005 episode ‘Dalek’, for example, Christopher Ecclestone’s Doctor describes the Dalek as “the ultimate in racial cleansing”. ‘The Daleks’ is significant for other reasons beyond the introduction of the series’ most implacable foes. Early in the series the character of the Doctor himself was not so well established: he was meant to be mysterious and, possibly, dangerous. Here it is the Doctor’s scientific curiosity that endangers the lives of his companions: he deliberately removes a vital mercury fluid link from the TARDIS in order to provide an excuse for investigating the Dalek city against the wishes of the others. The Thals help the travellers by leaving drugs to counter the effects of radiation but the Doctor sees no reason to stay and help the Thals and is quite prepared to leave them to their fate: “The Thals are no concern of ours. We cannot jeopardise our lives and get involved in an affair which is none of our business.” It is only when he realises that the fluid link has been left in the Dalek city that the Doctor decides to ‘get involved’ – and this is because he needs the Thals’ help rather than for any altruistic reason. The Doctor’s self-interest (one might even say selfishness) in this story is rather at odds with the more usual image of the Doctor as a champion of the oppressed and vulnerable. It is a reminder that in ‘The Forest of Fear’ (the third episode of the preceding Stone Age serial now often forgotten in popular histories of Doctor Who) the Doctor had even appeared to be on the verge of finishing off a wounded caveman with a blow to the head in order not to impede their escape. These darker, dangerous characteristics would soon disappear, subsumed by William Hartnell’s combination of didactic authority and mischievous humour. It would be fair to say that ‘The Daleks’ is not a perfect story. At seven episodes it’s too long: there are significant longeurs in the narrative, and episodes 5 (‘The Expedition’) and 6 (‘The Ordeal’), especially, are dragged out as Ian leads a small group of Thals through the swamp and caves to find a way back into the Dalek city. But as well as its historical significance for both the internal and external history of Doctor Who, I still think it’s one of the best – possibly even the best – of the Dalek stories. ‘The Dalek Invasion of Earth’, which followed a year later, is notable for some iconic visual moments such as Daleks crossing Westminster Bridge and patrolling Trafalgar Square, but again has many longeurs over six episodes and the rationale for the Dalek invasion – to mine the Earth’s core and pilot the planet through space – is fairly implausible even by the standards of Doctor Who. ‘The Chase’ – in which the Daleks construct a time machine of their own to hunt down and destroy their ‘greatest foes’ – gave the first indication that the Daleks were becoming stock monsters. They also started to be treated for comedy: their encounters with a hillbilly American tourist and fairground robots of Count Dracula and Frankenstein’s Monster suggest that they were being played for laughs. 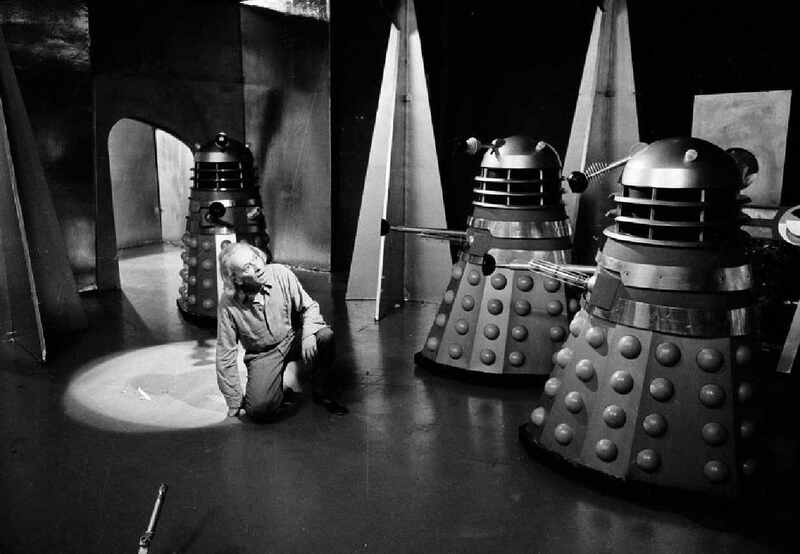 ‘The Daleks’ Master Plan’ was intended to restore the original menace of the Daleks but at 12 episodes it was interminably long and, due to the sharing of writing and directing duties, the style and tone were uneven. Hence moments of tragedy, including the deaths of two companions (Trojan slave girl Katrina and Space Security agent Sara Kingdom) sit uneasily with comedy incidents such as a chase through a 1920s Hollywood film studio and a stop-off at the Lord’s Test Match. It had been intended to retire the Daleks from Doctor Who after ‘The Evil of the Daleks’ in 1967 – Terry Nation had ambitions to use them in a television series in America – and they were absent from television screens for five years. They were brought back to launch Series 9 in 1972 with ‘Day of the Daleks’ – an ingenious time-loop paradox narrative hampered by budgetary constraints: it is painfully obvious that there are only three functioning Dalek props in the whole serial. Nation returned for two rather formulaic stories, ‘Planet of the Daleks’ and ‘Death to the Daleks’, before rewriting the origin story in ‘Genesis of the Daleks’ which introduced the character of Davros, the evil scientific genius who created the Daleks in his own image. By this time Doctor Who was not only drawing upon but rewriting its own internal history. ‘The Daleks’, in contrast, belongs to the formative period of the series when it was still evolving that mythos. There is still a sense of the Doctor discovering the universe rather than having knowledge that neither his companions nor the audience possess – a sense of wonder and curiosity rather than the Doctor Know-It-All who emerged later. And it is none the worse for that. This entry was posted on November 19, 2014 by Who Watching in Classic Doctor Who and tagged Carole Ann Ford, Christopher Barry, Doctor Who, Jacqueline Hill, Terry Nation, The Daleks, Top Ten, Verity Lambert, William Hartnell, William Russell.